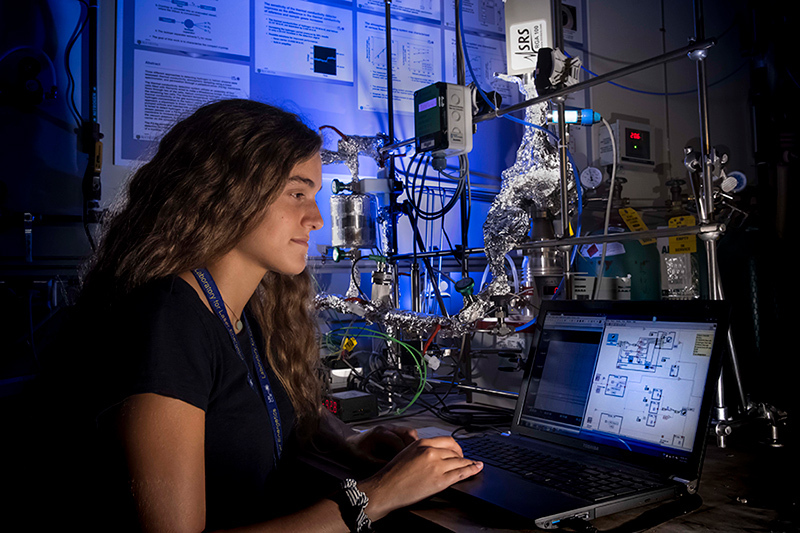 Two local teens have been designated as Scholars in the prestigious Regeneron Science Talent Search (formerly the Intel Science Talent Search) for research projects they carried out last summer at the University of Rochester’s Laboratory for Laser Energetics (LLE). Seniors Maia Raynor of Brighton High School and Anirudh Sharma of Webster Schroeder High School are among the 300 Scholars nationwide chosen from nearly 2,000 who entered the competition. They will each be awarded $2,000 and their schools will receive $2,000 to support their science, math and engineering programs. New York’s Senator Charles Schumer and Congressman Joe Morelle congratulated the students. “It is inspiring to see these talented high schoolers engage with groundbreaking research and be recognized nationally for the incredible scientific work they are able to achieve with the resources at Rochester Laser Lab,” Schumer said. “And thank you to the University of Rochester for enabling the success of these students by allowing them to leverage groundbreaking technology and research that is taking place at the Laboratory for Laser Energetics,” Morelle added. Raynor used a copper-zinc alloy to remove elemental hydrogen from air. This novel approach offers several advantages over traditional techniques of extracting tritium from air streams and provides the tritium community with a simplified method of reducing emissions to the environment. She was advised by Walter Shmayda, an LLE senior scientist, and Cody Fagan, a graduate student. Sharma carried out hydrodynamic simulations of a new “double cone-in-shell” target concept for the National Ignition Facility (NIF) in support of experiments related to studying the internal structure of the sun. He showed that with optimally chosen parameters a short pulse of x-rays can be produced from a point source. The NIF is the world’s largest laser, located at the Lawrence Livermore National Laboratory (LLNL). LLE collaborates closely with LLNL. 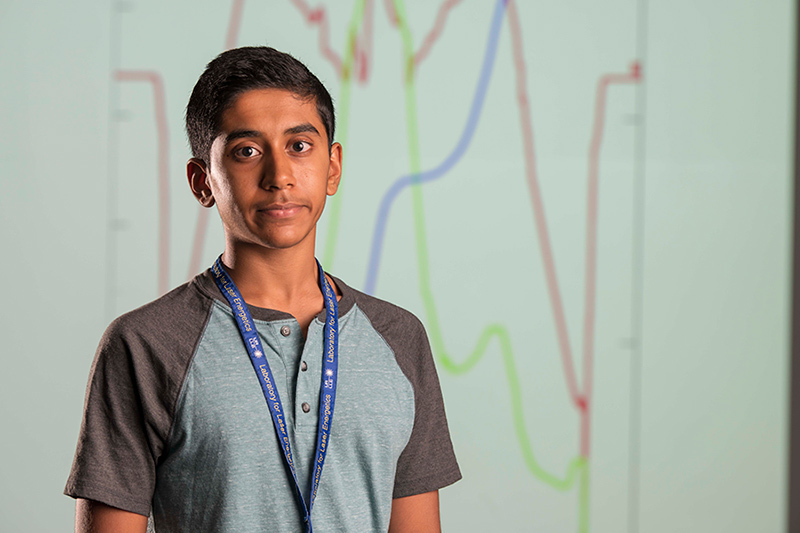 Sharma was advised by Stephen Craxton, LLE physicist and high-school program director. LLE has as its primary mission the study of the conditions necessary to create and sustain fusion. Involving young adults in state-of-the-art science, however, is another important goal that LLE’s scientists and engineers take very seriously. LLE started its Summer High School Research Program in 1989 and has had 377 participants to date. “Our program provides a unique educational opportunity for talented high-school students. They’re amazingly motivated, and it’s exciting to see them recognized as among the best in the nation,” said Craxton. Students working at the laboratory have made up the large majority of Rochester-area Science Talent Search Scholars honored during the past three decades. A total of 38 students from the LLE program have now become Scholars. Application materials for LLE’s summer program are sent to area high schools and placed on the LLE website in early February or can be obtained directly by calling Jean Steve at 275-5286. For more information about the program itself, please contact Craxton at 275-5467.